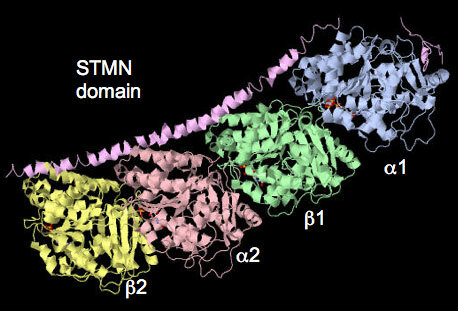 This project extends our work on the tubulin-associated stathmin (STMN) family of phosphoproteins as key downstream effectors directly linking kinase activity with microtubule dynamics. Stathmin family proteins negative regulate microtubule polymerization by binding and sequestering monomers (ie. a/b tubulin). Their regulated activity contributes greatly to dynamic nature of microtubules in all cell types. Stathmin-regulated microtubules in neurons control synaptic activity translating into learning and memory. Hyperactivation and overexpression of STMN accelerates cancer cell proliferation and migration to significantly worsen patient prognosis in a broad range of cancer types. Defining the MAPK-STMN signalling relationship is therefore of high importance to human health. STMN has microtubule destabilizing activity and overexpression disrupts microtubules in cells (adapted from Yip et al. 2014). Stathmin mediates neuroblastoma metastasis in a tubulin-independent manner via RhoA/ROCK signaling and enhanced transendothelial migration. 2. Yip, Y.Y., Yeap, Y.Y., Bogoyevitch, M.A. & Ng, D.C.H. 2014.
cAMP-dependent protein kinase and c-Jun N-terminal kinase mediate stathmin phosphorylation for the maintenance of interphase microtubules during osmotic stress. J Biol Chem, 289, 2157-69. 3. Ng, D.C.H. and Byrne, F. 2012. “Stathmin and cancer.” Chapter 14, 259-284. Book Title: The Cytoskeleton and Human Disease. Kavallaris M. [Ed.]. Spinger Press, NY, USA. Scaffolds proteins interact with kinases to assemble distinct signalling modules for exquisite spatiotemporal control of phosphorylation activity. Our lab recently characterized a c-Jun N-terminal kinase (JNK) binding protein, WDR62, as a microtubule-associated scaffold protein required to direct phosphorylation at the bipolar mitotic spindle to control cell division and differentiation of neural stem and progenitor cells. WDR62 mutations are causative of human primary microcephaly, a birth defect characterized by severely reduced head and brain size. This highlights the importance of WDR62-regulated signalling events in human brain development. This project will probe how WDR62 controls neural stem cell proliferation, fate commitment and brain growth using defined model systems. 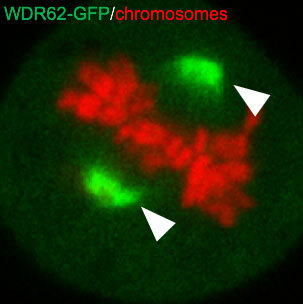 WDR62 is a kinase-associated scaffold protein localized to the mitotic spindle poles. It’s functions here are required for normal brain development in humans (adapted from Lim et al. 2015). 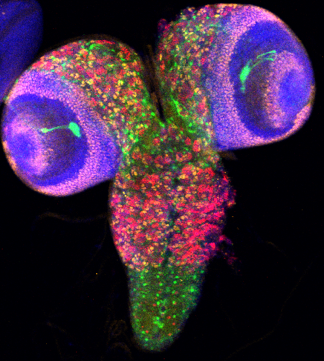 Drosophila larval brains. This project take advantage of excellent model systems such as the developing fly brain as an in vivo model to study neural stem cell renewal and differentiation. Findings are further translated to mouse embryos as a mammalian model of neurodevelopment (unpublished from Lim NR). 1. Lim, N.R., Yeap, Y.Y., Ang, C-S., Williamson, N.A., Bogoyevitch, M.A., Quinn, L.M. and Ng, D.C.H. 2016. Aurora A phosphorylation of WD40-repeat protein 62 for mitotic spindle regulation. 2. Lim, N.R., Yeap, Y.Y., Zhao, T.T., Yip, Y.Y., Wong, S.C., Xu, D., Ang, C.S., Williamson, N.A., Xu, Z., Bogoyevitch, M.A. & Ng, D.C.H. 2015. Opposing roles for JNK and Aurora A in regulating WD40-Repeat Protein 62 association with spindle microtubules. 3. Bogoyevitch, M.A., Yeap, Y.Y., Qu, Z., Ngoei, K.R., Yip, Y.Y., Zhao, T.T., Heng, J.I. and Ng, D.C.H. 2012. 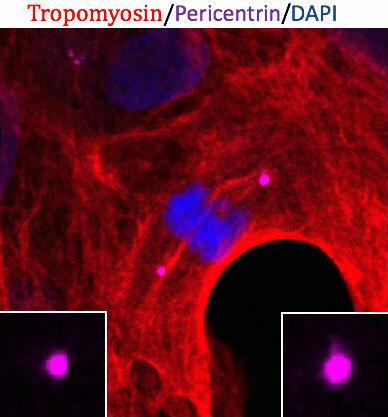 WD40-repeat protein 62 is a JNK-phosphorylated spindle pole protein required for spindle maintenance and timely mitotic progression. J Cell Sci, 125, 5096-109. Centrosomes are an enigmatic membrane-less, protein-dense organelles that co-ordinate intracellular signalling and cytoskeleton organization. At its core, centrosomes are comprised of a pair of asymmetric tubulin barrels (centrioles) that are differentially segregated in self-renewing pluripotent stem cells. Multiple intracellular kinases are concentrated at centrosomes to form a signalling hub that is essential for cell cycle regulation, division orientation and cortical polarity. Thus, centrosome structure and function is intimately involved in maintaining proliferating stem cells and the fate commitment and differentiation of their progeny. This project will utilize myocytes and neurons from human pluripotent embryonic stem cells to investigate how centrosomal kinases control cell fate in neural and cardiac systems. Centrosomes (magenta) in an immature dividing cardiac myocyte. Centrosome function is required to maintain the proliferative capacity of immature embryonic myocytes (unpublished image from Hannah Perks and Dominic Ng). Cardiovascular disease, encompassing myocardial infarction and heart failure, is the leading cause of worldwide mortality (12.8% of all deaths) and contributes significantly to the escalating health care expenditure and disease burden in most developed nations. 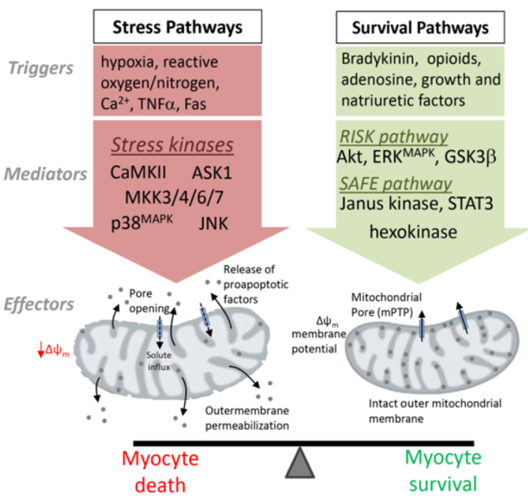 Mitogen-activated protein kinases mediate protective and compensatory responses in the heart but paradoxically, hyperactivation of certain family members can trigger cardiac cell death to exacerbate myocardial injury and significantly increase the risk of heart failure. This project will delineate the protective versus detrimental effects of MAPK signalling pathways in the heart to better define kinase-targeting drug therapy for cardioprotection or ameliorate heart failure progression in the clinic. Signalling mechanisms that regulate cardiomyocyte survival and myocardial injury. 1. Lim, N.R., Thomas, C.J., Silva, L.S., Yeap, Y.Y., Yap, S., Bell, J.R., Delbridge, L.M., Bogoyevitch, M.A., Woodman, O.L., Williams , S.J., May, C.N. and Ng, D.C.H. 2013. Cardioprotective 3',4'-dihydroxyflavonol attenuation of JNK and p38(MAPK) signalling involves CaMKII inhibition. 2. Ng, D.C.H., Ng, I.H., Yeap, Y.Y., Badrian, B., Tsoutsman, T., McMullen, J.R., Semsarian, C. and Bogoyevitch, M.A. 2011. Opposing actions of extracellular signal-regulated kinase (ERK) and signal transducer and activator of transcription 3 (STAT3) in regulating microtubule stabilization during cardiac hypertrophy. J Biol Chem, 286, 1576-87.